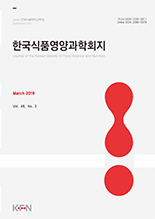 황초롱, 오승희, 김현영, 이상훈, 황인국, 신유수, 이준수, 정헌상,(2011).열처리 온도에 따른 더덕과 도라지의 화학성분과 항산화활성.한국식품영양과학회지,40(6),798-803. 열처리에 따른 더덕과 도라지의 성분과 항산화활성 변화를 살펴보기 위하여 110~150℃에서 2시간 열처리한 후 항산화활성 및 유리당, 유기산, 5-HMF 함량을 살펴보았다. 총폴리페놀 함량은 대조구에서 각각 0.60 및 0.59 ㎎ GA eq/g이었으며, 150℃에서는 각각 6.31 및 7.34 ㎎ GA eq/g으로 증가하였다. 항산화활성은 열처리 온도의 증가에 따라 증가하였으며, 환원력도 대조구의 0.1 및 0.06에서 열처리 후 0.54 및 0.50으로 증가하였다. 더덕의 fructose 함량은 120℃까지는 증가하다가 130℃ 이상에서는 감소하였으며 sucrose의 함량은 130℃ 이상의 온도에서는 검출되지 않았다. 도라지 fructose 함량은 130℃까지는 계속 증가하였으나 140℃ 이상의 온도에서는 감소하였으며 sucrose 함량은 더덕과 마찬가지로 130℃ 이상의 온도에서는 검출되지 않았다. 유기산은 더덕과 도라지에서 모두 열처리 온도가 증가함에 따라 증가하였다. 5-HMF 함량은 대조구에서는 검출되지 않았으며 110 및 120℃에서는 변화가 작았지만 130℃ 이상의 온도에서는 급격한 증가를 보였다. We investigated the changes in chemical composition and antioxidant activity of Deoduk (Codonopsis lanceolata) and Doragi (Platycodon grandiflorum) with heating. Deoduk and Doragi were heated to 110~150℃ for 2 hours. The total polyphenol content of Deoduk and Doragi reached high values of 6.31 and 7.34 ㎎/g, respectively, at 150℃. The total polyphenol content of raw Deoduk and Doragi were 0.60 and 0.59 ㎎/g, respectively. The DPPH radical scavenging activity (IC??) of Deoduk and Doragi decreased from 13.94 and 6.83 ㎎/㎖, respectively, in raw samples to 0.81 and 0.94 ㎎/㎖, respectively, in samples heated to 150℃. The ABTS radical scavenging activity of Deoduk and Doragi increased from 0.43 and 0.21 ㎎ AA eq/g, respectively, in raw samples to 3.55 and 4.83 ㎎ AA eq/g, respectively, in samples heated to 150℃. The reducing power of raw Deoduk and Doragi was 0.1 and 0.06, respectively, which was increased to 0.54 and 0.50, respectively, in samples heated to 150℃. Fructose content decreased after heating to 130℃. The sucrose content of the samples increased slowly with heating up to 120℃, but was not detected at warmer temperatures. The organic acid and 5-HMF of the samples increased gradually with increasing temperature.